Herding Donkeys is a tense 223-page documentation of the last eight years in American politics. In it, Ari Berman doesn’t argue that the Democratic Party needs to change its ways so much as tell how it’s been done. Finally. For someone who rarely reads the news, Herding Donkeys was a daunting book to approach, but only a few pages in I began to recall the events Berman details. Back in 2003 I decided to do a little research on the 2004 presidential candidates. I wasn’t old enough to vote, but I was old enough to form an opinion and wanted to be ready for the upcoming election. After sifting through the democratic candidates, I decided Howard Dean was the man for the job. Who could argue with his success in Vermont as Governor, or the education improvements he made in his home state? What I couldn’t understand was why everyone wasn’t behind this guy; why didn’t anyone know who he was? A week later the Howard Dean Scream played on repeat on news stations all over the country. What ordinary citizens like me didn’t know at the time was that the Dean Scream came after a series of unexpected wins for a guy that most people didn’t even know existed. The first half of Herding Donkeys chronicles the unlikely victories for Howard Dean and their (sometimes) careful construction. Dean pioneered the Fifty State Strategy, taking his campaign into the reddest states, often ignored by traditional Democrat campaign trails, and implemented another unique strategy: listening to people. We all know that Dean was never elected president, that he pulled out of the race after seeing footage of his own scream on the news, but what Berman shows in the second half of his book is the way Dean paved the way for Obama’s success. Ari Berman’s book sheds new light on how we got the political landscape we have now, and does so with surprising readability. He puts the recent Democratic success into context and makes it easy to see why so many democrats came out of the woodwork in the last presidential election: people finally felt that they were being heard and that their vote really mattered. 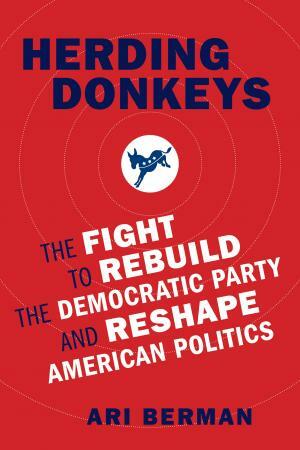 No matter what your political leaning may be, Herding Donkeys is an inspiring show of creativity and revolutionary approaches to traditional political campaigning. The ideas that are so well stated in this book effect more than who our next president is, it helps us work for change on all fronts and reminds us that our actions are significant.